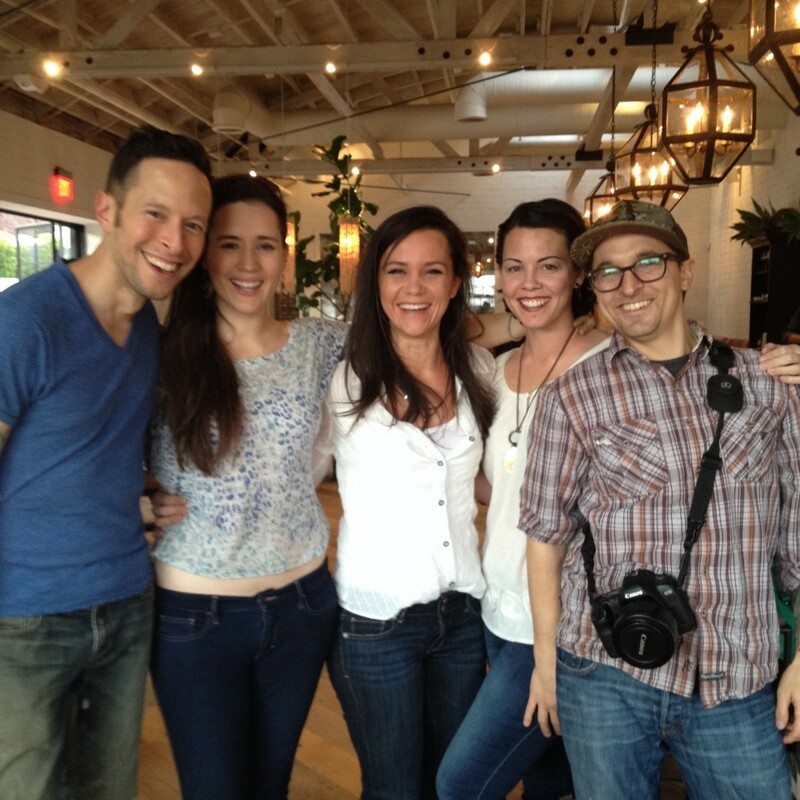 When I left San Francisco almost 3 years ago there were two major things I was going to miss: my best friend Jen and Gracias Madre, a vegan Mexican restaurant owned by the same folks that run Cafe Gratitude. The thought of leaving behind those comforting delicious meals weighed heavily on my heart, but the plethora of vegan restaurants L.A. had waiting for me helped ease the pain a bit. 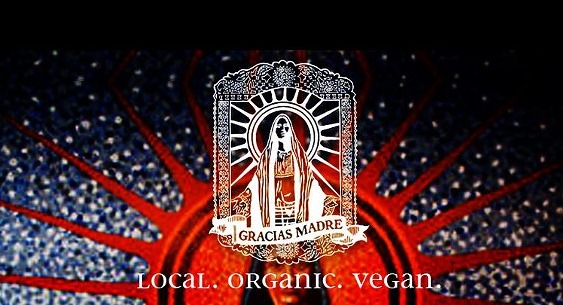 Within the first week of moving down here, we went to Cafe Gratitude in Venice and I asked the manager if there were plans to open a Gracias Madre down here and he said the only word I wanted to hear at that moment: yes. Since then I have been waiting not so patiently for them to open and last week it finally happened and now I have no reason to leave Los Angeles ever. The local vegan community has been abuzz about the opening all week and I was all geared up and ready to be there in West Hollywood the second they opened at 11am on 1/17, but alas, life got in the way (a.k.a. I had a bad cold and slept in) and I didn’t make it there. Luckily my friends were able to score a reservation for Saturday and we were invited to join them. Normally I don’t care much about being the first on the scene, but I had been counting the seconds until this place opened and wanted to experience it the first weekend. We were a group of 8 and I was the first to arrive. The amount of giddiness I felt as I parked the car and walked towards the front door was palpable and I’m sure it showed all over my face. As soon as I walked in I was overcome by the beauty of the huge 5000 sq ft space. Open, bright, elegant…much different from the more intimate taqueria feel of the SF location, but I was instantly in love. I started imagining future birthday gatherings and celebrations there. 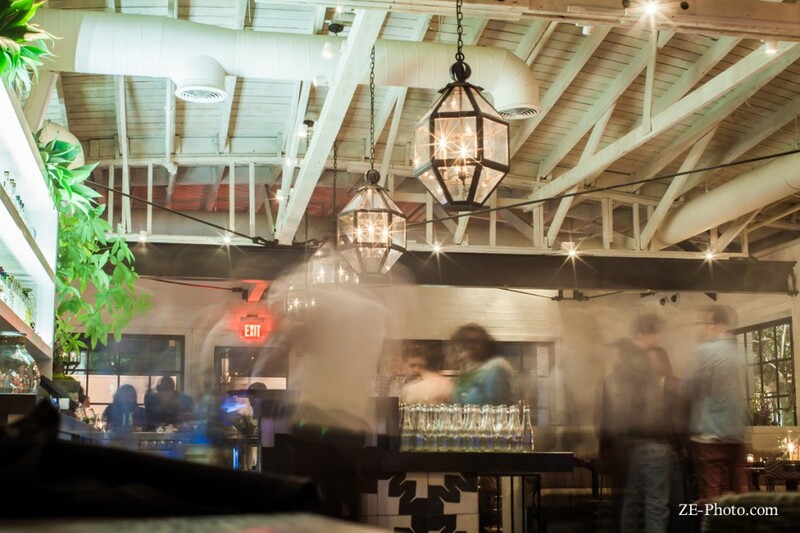 I spotted the humongous outdoor patio and looked forward to warm summer evenings spent sipping organic margaritas and laughing with friends. It’s just absolutely gorgeous. I sat down at the bar and was greeted by the very friendly beverage director and ordered the Lavanda – Tequila blanco, lavender syrup, lime, & lavender bitters. It came in a tall glass garnished with fresh lime and flowers. It was almost too pretty to drink. Almost. Cocktails never last long in my presence but this drink deserved to be savored slowly. It tasted so fresh and the lavender added such an interesting flavor to the tequila. Plus it was strong – muy beuno! The rest of the group arrived, we were seated and then the hard part came – trying to decide what to order! I wanted to eat all. the. food. We narrowed it down to a few apps for the table: Pepitas, Guacamole, Gorditas, Quesadillas De Calabasa and Papas Al Horno (you can find all the descriptions of them here). The standouts were definitely the Papas and Gorditas. The papas were perfectly prepared to be crispy on the outside, soft on the inside with the garlic pairing wonderfully with the spice of the warm chipotle cashew cheese. 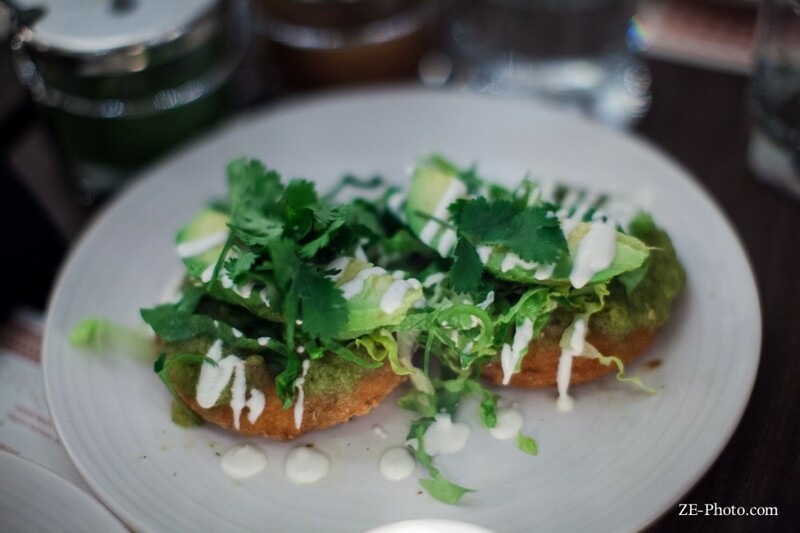 The gorditas were everything I remembered them being: delightful potato-masa cakes topped with creamy avocado and cashew crema and a bit of spice from the salsa verde – a harmonious blending of tastes and textures. Next came the entrées. 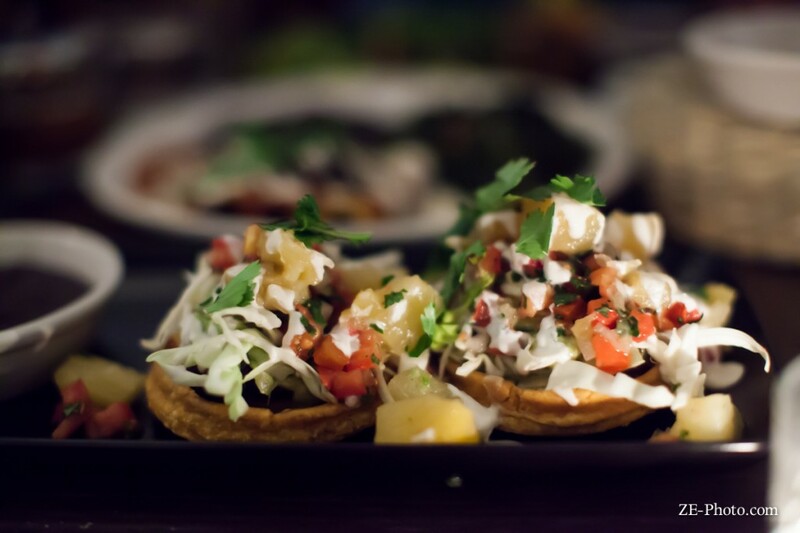 It was so hard to decide between the tamale, the flautas, the chilaquilas, but ultimately I opted for the Sopas Con Piña – two masa cakes topped with guacamole, pineapple habanero salsa, pickled cabbage, cashew crema and cilantro served with a side of seasoned black beans. This dish was beautifully presented and offered an array of flavors in every bite. Portions here are generous without being gluttonous so you can have an app and an entrée and still have room for dessert! Most of the table went for the flan, but I’m not a fan of flan. It’s a texture thing for me more than anything, it’s just too gelatinous for my liking. 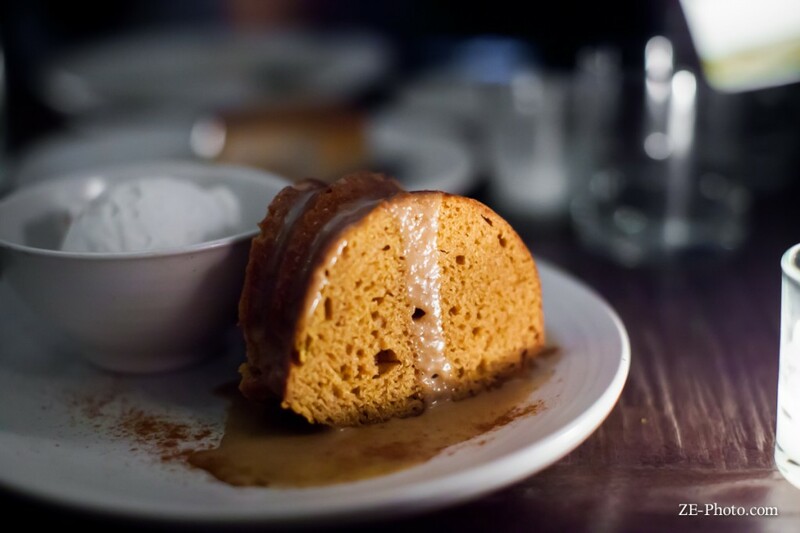 Instead, I ordered the Spiced Pumpkin Cake with maple cream sauce and vanilla coconut ice cream. This cake was seriously one of the highlights of my meal. It was so moist, heavy on the spice and not so overpoweringly pumpkin. I was nice enough to offer bites to the rest of the table and they were all sad they didn’t order the cake as well! It was the best way to end the meal. 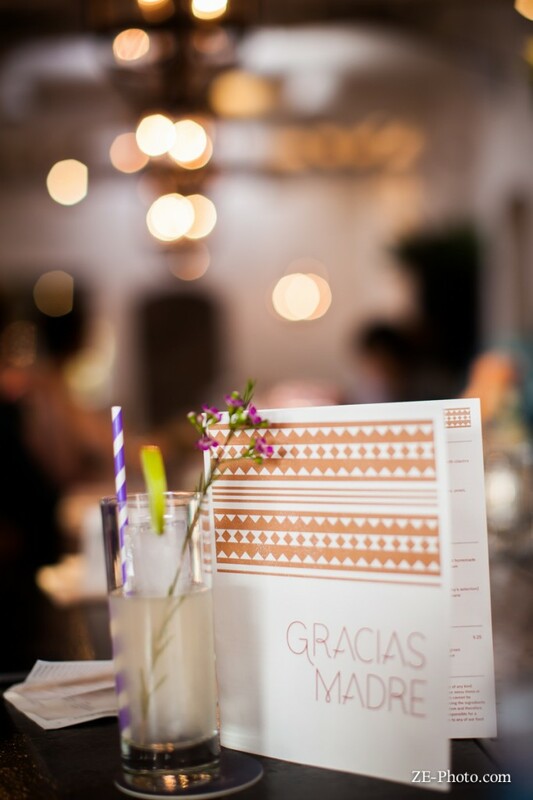 Besides the amazing company and warmth we felt from the staff and environment, the food will keep bringing me back to Gracias Madre over and over.